There are no shortage of Ottawa winter activities to keep you busy, laughing, and make great vacation stories upon your return home. 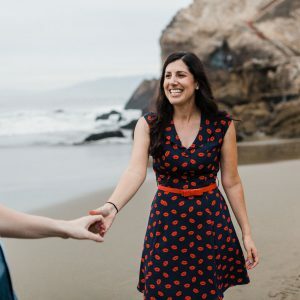 You might have to ignore any skeptical attitudes you encounter while planning your trip though. It was similar to the raised eyebrows I got a few times when I mentioned that I was visiting the Canadian capital. So when a Canadian customs officer in Montreal was skeptical of my motives, I wasn’t entirely caught off-guard. How did such a pretty place get the reputation for being less-than-appealing? It’s undeserved from my experience there. And I’ve been to quite a few state and country capitals that weren’t really worth the travel. Canberra, I’m looking directly at you. Canada’s capital is not one of those boring, bureaucratic-heavy places with no heart. And it’s even more beautiful when it’s covered with a winter blanket of snow and the Rideau Canal is frozen over, ready for ice skaters. I visited Ottawa in mid-February, which is supposedly the coldest time of year. And the city definitely lived up to its reputation. The mercury actually dipped to a frosty -20°C (here’s the proof) on my last proper day there. Unfortunately I had to work for a few days in Ottawa, which pushed site-seeing duties to the evenings. Although I did manage to crowbar in lots of tourist-activities into two gloriously sunny weekend days. Basically I experienced Ottawa at its most inhospitable and even then it was one of the most convivial places I’ve been it. The crisp air on my face, ducking into restaurants and cafes to warm up and snow everywhere except the roads and footpaths (sidewalks). Exactly the way you want it to be! 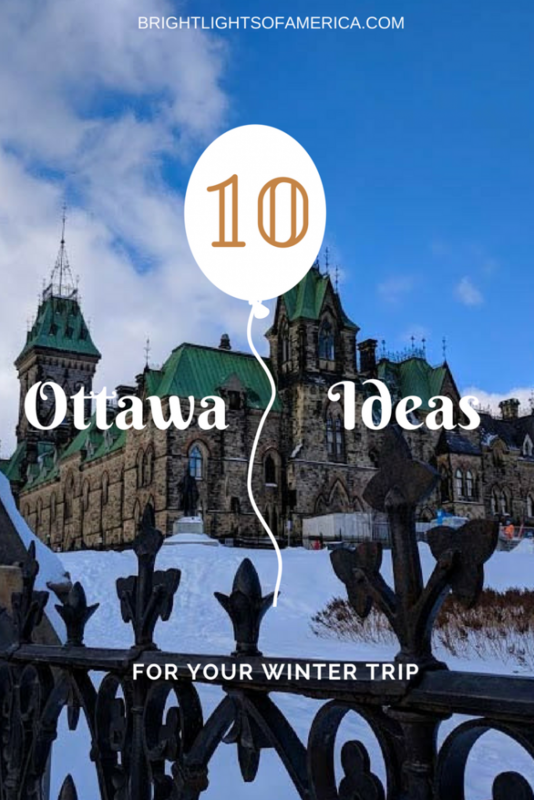 Here’s a list of my 10 favourite Ottawa winter activities that I don’t think you should miss! For three weeks in February (this year it was Feb 2-19), Ottawa celebrates winter with style. And as you’ve already read, it can get mighty cold during the month. But it shouldn’t deter you from being outside as long as you’ve got the right winter clothes. There’s live music and dancing to warm you up on Friday and Saturday nights anyway (here’s the full schedule of events). 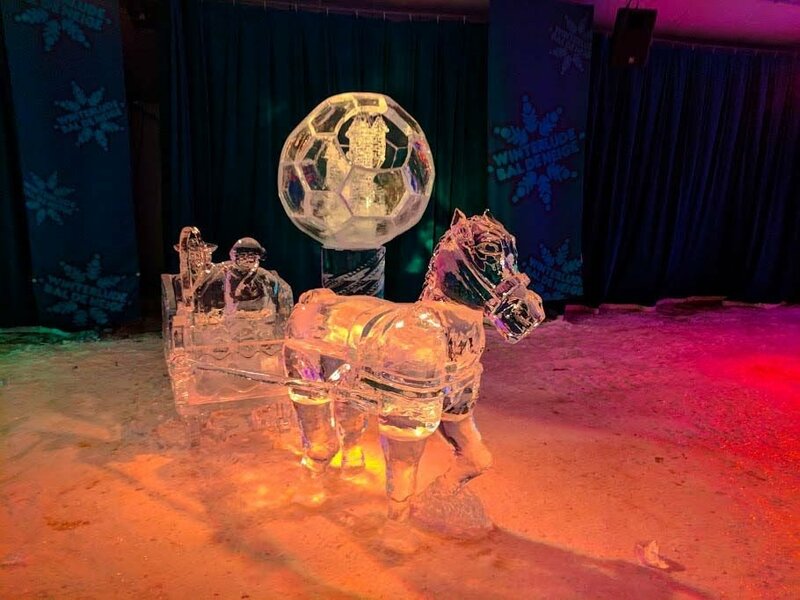 If you’re looking for something that’s a little more sedate but with a fair amount of torque, try the Crystal Garden Ice Carving Competition. 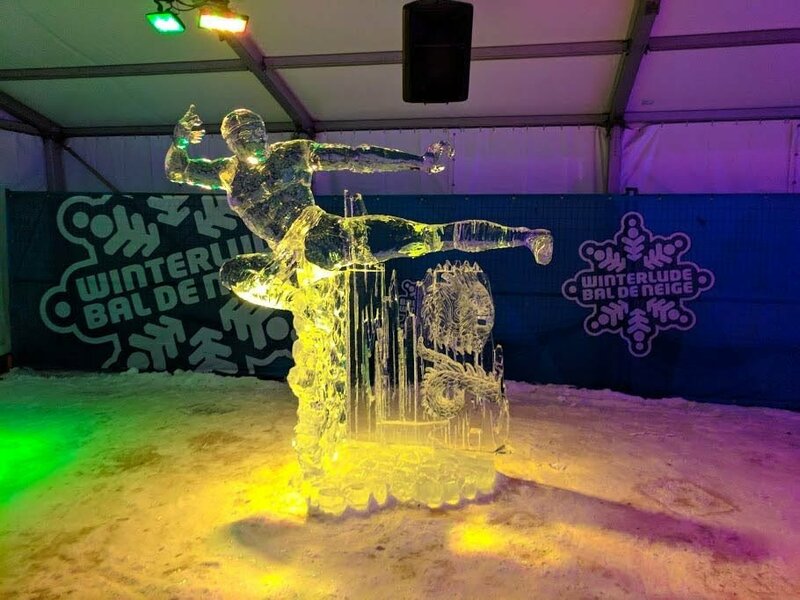 The competition brings professional ice carvers (and their chain saws/tools) from all over the world to show off their skills in creating icy masterpieces. I saw intricately carved dinosaurs, minotaur-like monsters, alpine skiers, fairies, angels, castles and at least one Pegasus. It’s amazing what they can do with a slab of frozen water! Speaking of frozen water, how would you like to go dragon boat racing on some? 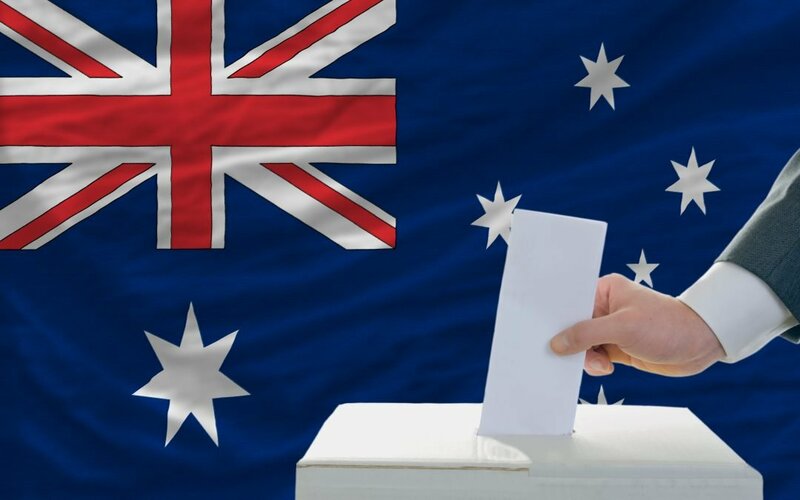 It sounds like a lot of effort, so why not leave it to the professionals. Dragon boating in the off-season is decidedly difficult. Picture: Ottawa Ice Dragon Boat Festival. The Ottawa Ice Dragon Boat Festival is the only one of its kind in North America and unfortunately I arrived one day too late to witness it for myself. It’s where Chinese culture and Canada’s love of winter sports meet for a day of spirited competition. 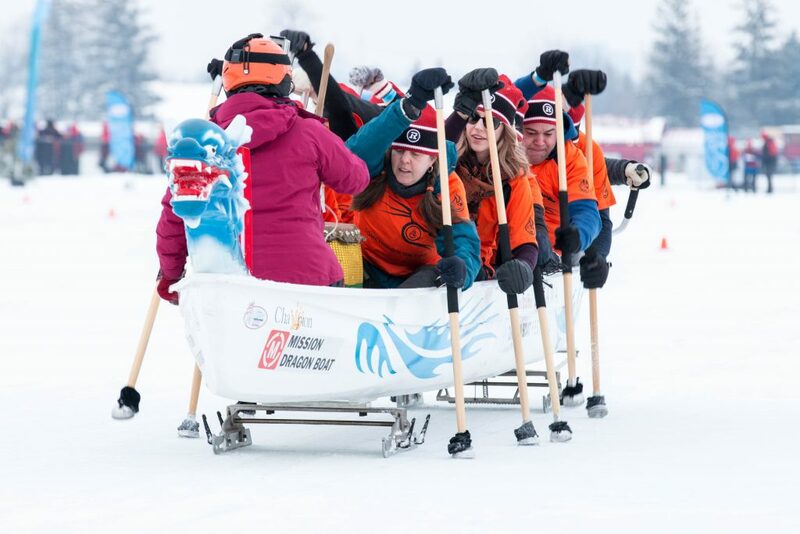 Head over to Dow’s Lake to watch teams who have fitted huge “skates” to their dragon boats, battle it out to “skim” across the lake’s icy surface. Picture: Ottawa Ice Dragon Boat Festival. Admission is free and you can also witness the town crier announcing events, face painting and food. We’re not done with the ice just yet. I mean, if it’s there you might as well use it to your advantage. Many hotels and hostels offer ice skate rentals so you can skate on the Rideau Canal. 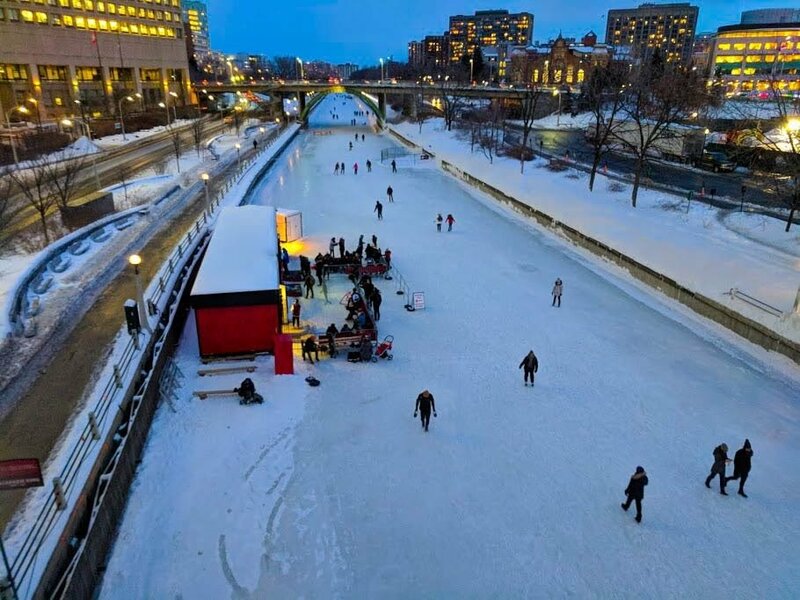 So the third most wintery of Ottawa winter activities would have to be ice skating on the Rideau Canal – the world’s largest and second longest ice skating rink. At a 7.8 km (4.8 mi), you’re bound to get a nice work out on the rink that runs from Hartwell Locks to the Locks between the Parliament Buildings and Chateau Laurier. You can skate at anytime of the day or night, but I highly recommend visiting while the kiosks are open so that you can sample a Beavertail. The canal is usually open for skating between January and March, but it really depends on the weather. Fair warning, this mall feels huge and I may have gotten lost in it twice. It’s a mecca of all the big Canadian and international brands but there’s another reason I loved it in winter. The results of taking a photo a second too late while on an escalator. It’s warm. So very, very warm. And it’s centrally-located. So after my trip to visit the Crystal Garden Ice Carvings one evening I was absolutely frozen-through. 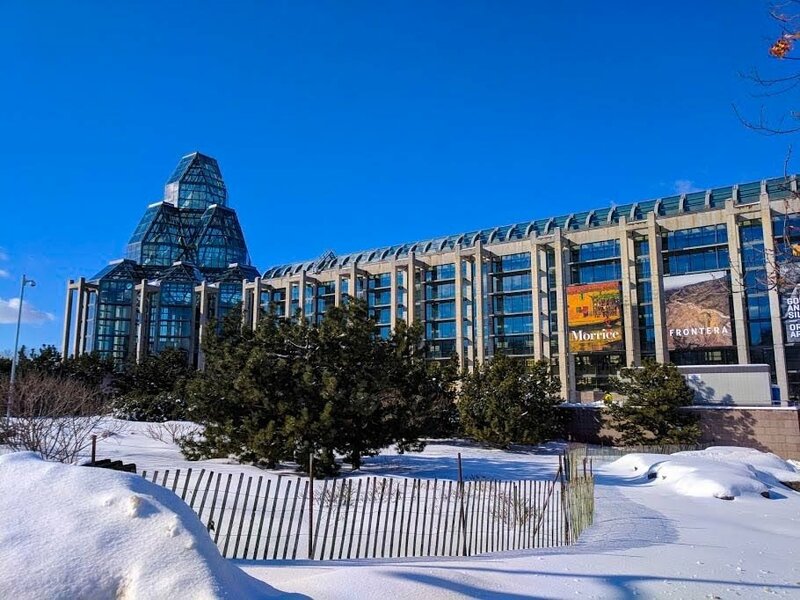 But the Rideau Centre is just a short walk away (and a short walk from Parliament House and a bunch of other attractions) and it’s a great place to windows shop whilst thawing out. I’m on a clothes-buying ban right now (because I’m all about the money saving) but if I wasn’t, I would definitely have blown some serious cash here. 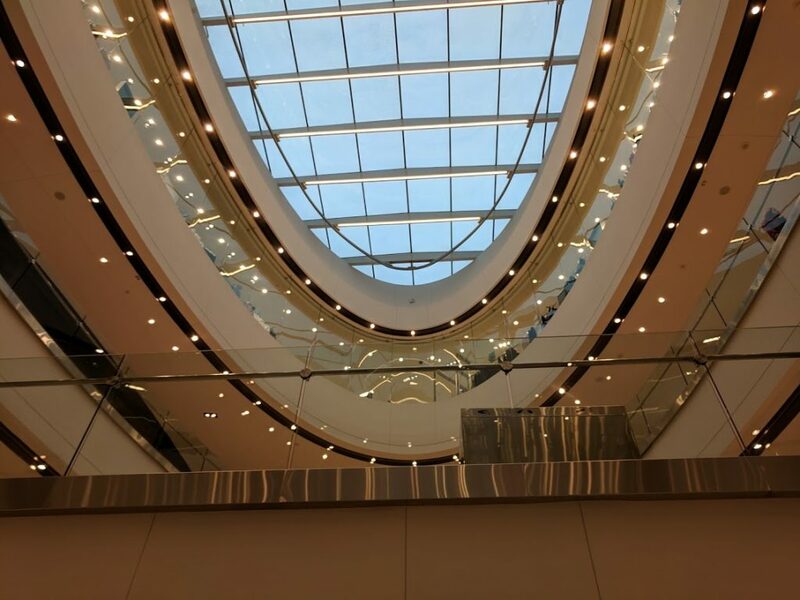 The centre spans four floors and includes 180 shops and a park on its roof. Did I mention that it’s warm? Growing up Catholic gives you a certain appreciation for church architecture I think. At least it did for me. 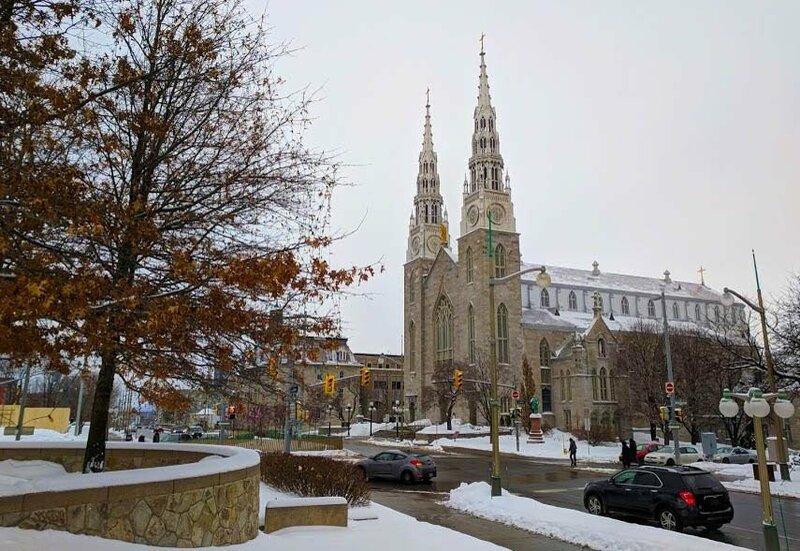 The Notre Dame Cathedral Basilica is across the street from the National Gallery of Canada. But, of course, you don’t have to be religious to appreciate a beautiful building. I stumbled across Notre Dame Cathedral Basilica as I was looking for the National Gallery of Canada. They’re right across the street from one another. I went in with no expectations because I hadn’t heard of it before and while the outside is lovely, it’s when you step through the foyer doors into the main cathedral building that you really become awed. 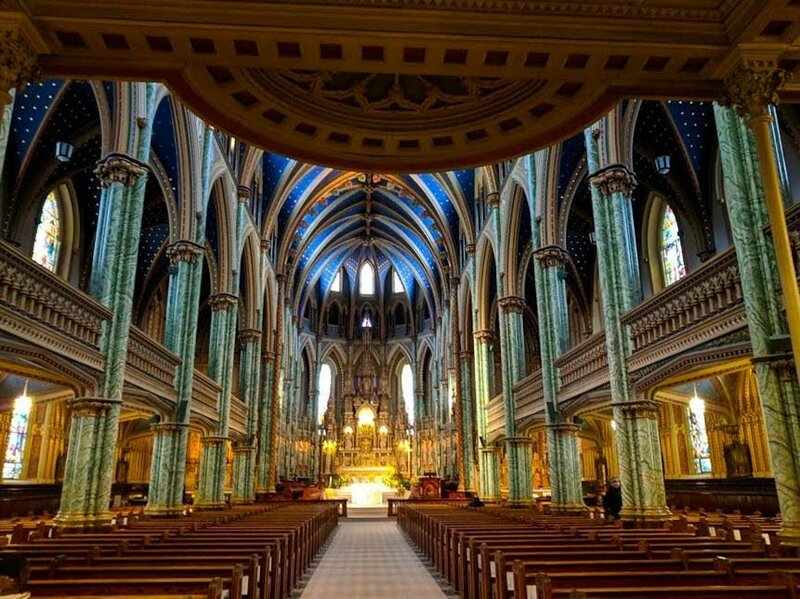 Building began in 1841 and the cathedral is both the largest and oldest church in Canada’s capital. You’ll have to look to the pictures for this because I could write a thousand words and still not describe its beauty. You can take guided tours during the summer months, but in winter its a good place to sit and soak up the art and serenity. Don’t forget to turn around and look up at the organ, which was built in 1892 by the sons of renowned organ-builder Joseph Casavant and refurbished in 1999. A hop, skip and a jump across Sussex Drive brings you to the National Gallery of Canada. The Maman sculpture greets you outside the National Gallery of Canada. The first thing you’re going to notice is the giant spider holding court over the open space in front of the gallery. 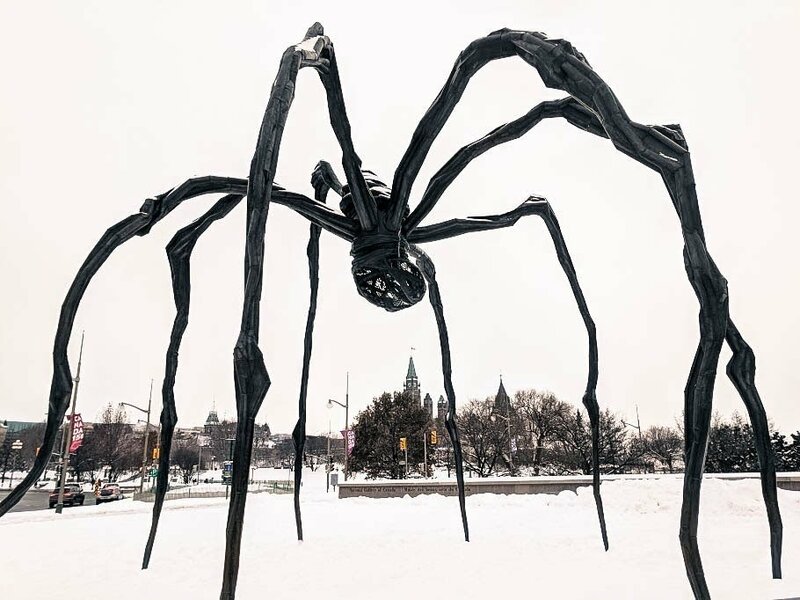 It’s called Maman, translating to “mother” from French, and was sculpted by Louise Bourgeois in 1999. Made of stainless steel, bronze and marble, the spider is nine metres (30 feet) tall. Other versions of the sculpture stand in London, Spain, Japan and Qatar. The Canadian sculpture cost $3.2 million. If you’re visiting during the wintertime it’s important to note that the National Gallery is closed on Mondays. I learned that the hard way so I didn’t get to see inside but apart it’s a great way to spend some time in Ottawa. After all of that exercise you’re probably hungry and Byward Market is a great place to find a place to eat. Byward market is an area of Ottawa that centres around a rectangular market building, which is honestly not that appealing from the inside. There are some market stalls in the middle of the building, which are surrounded by shops. Having said that, there are some great bars and restaurants in the area. I spent A LOT of my eating time in the Byward Market area because there’s such a diverse selection of cuisines to try. There’s Vietnamese, Mediterranean/Lebanese, Italian, Chinese, classic diner fare, seafood restaurants and steakhouses. 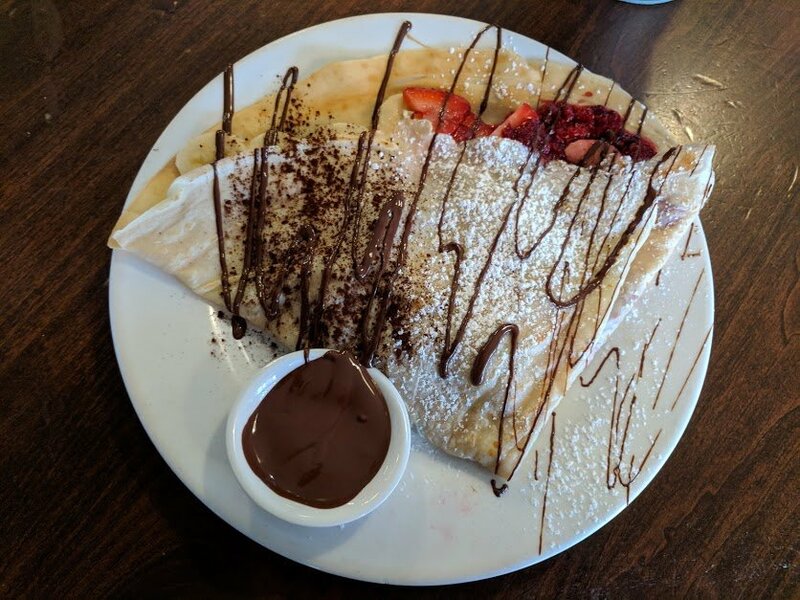 Not to be biased, but I am easily swayed when crepes are involved. This one’s from Cacao 70. Any food you can think of, they’ve got. Check out my “Where to eat in Ottawa” post for tips on my favourite restaurants and cafes. You can’t visit Ottawa without getting over to Parliament Hill. 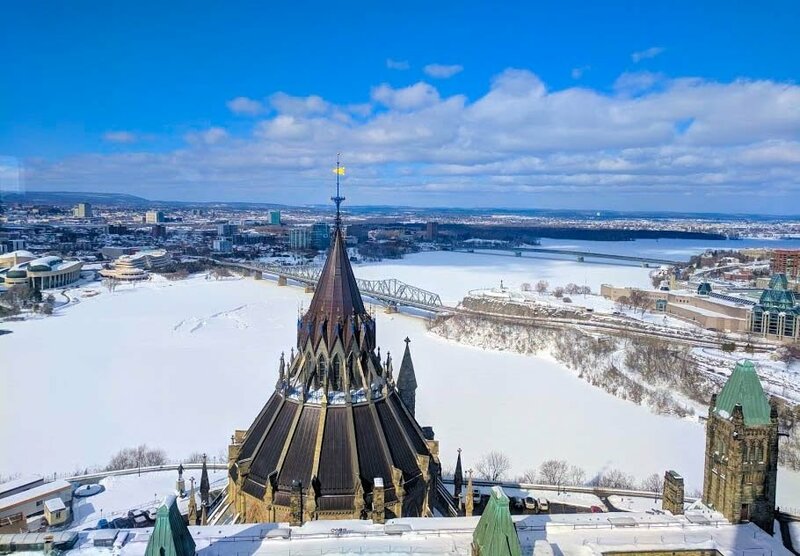 The Gothic-style buildings alone are worth seeing, but you can also do a free tour of the Parliamentary building (until the end of 2018) and climb to the top of the Peace Tower. The first parliament building burned down in 1916 but the library was saved when an employee closed its steel doors. It is the only original part of the structure left. 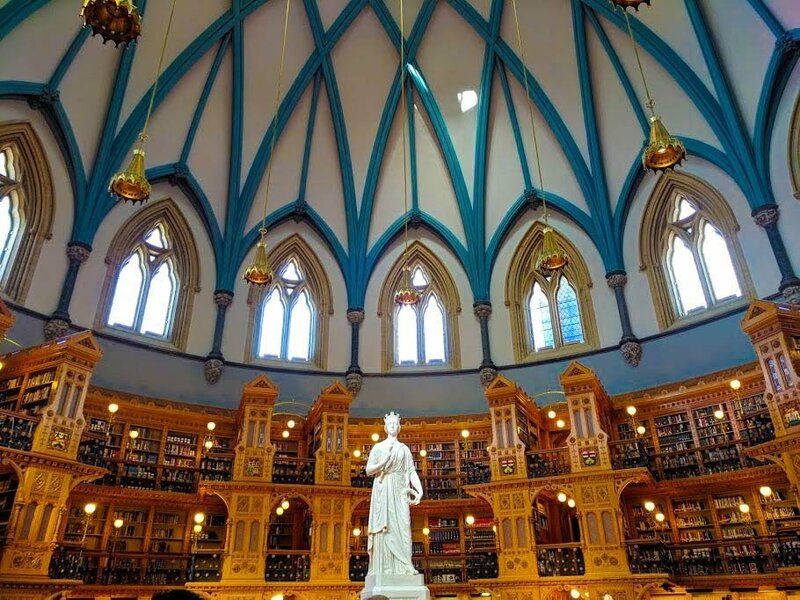 Queen Victoria holds court over Canada’s Parliamentary Library. Just viewing it from the outside will keep you busy for awhile. There are so many gargoyles perched ready to pounce and intricate stonework to take in. If you walk away from the central building, across Wellington Street to the building with the question mark above it you can get free tickets for the tour. They are issued on a first-come-first-serve basis. 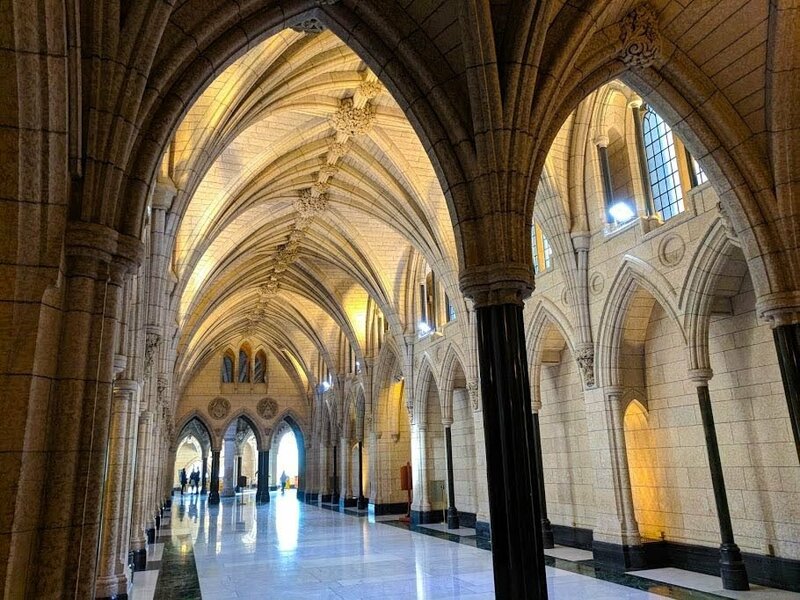 Even the hallways within Ottawa’s Parliamentary building catch your eye. The tours are popular and I was lucky enough to make it into a packed one, led by politics student Hannah. She spoke to us about the history of the building, the 1916 fire, let us view the beautiful library and took us to see the Senate. The House of Commons was sitting at the time so we didn’t interrupt those proceedings. 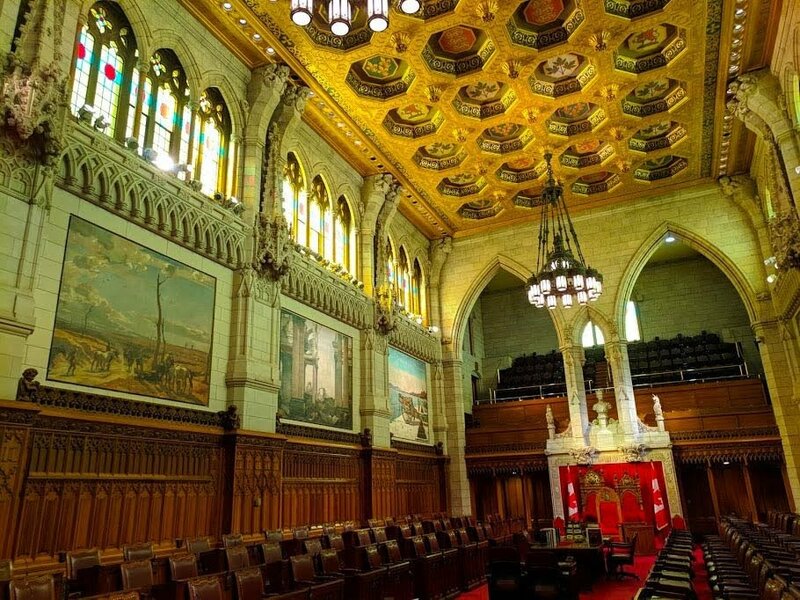 The “red room” seats Canada’s Parliament. The building is full of portraits of former prime ministers and monarchs as well as paintings of other notable events in Canada’s history. It ends with an optional visit to the Peace Tower. The 91 metre (298 foot) campanile casts an imposing shadow on the grassy expanse before it and offers beautiful views of the city and Ottawa River beyond. The Peace Tower is an imposing presence on Parliament Hill. The tower houses 53 bells and is dedicated to remembering the sacrifices of Canadians who served during World War I, but a memorial chamber at the bottom of the tower is devoted to Canadians who died during all conflicts. 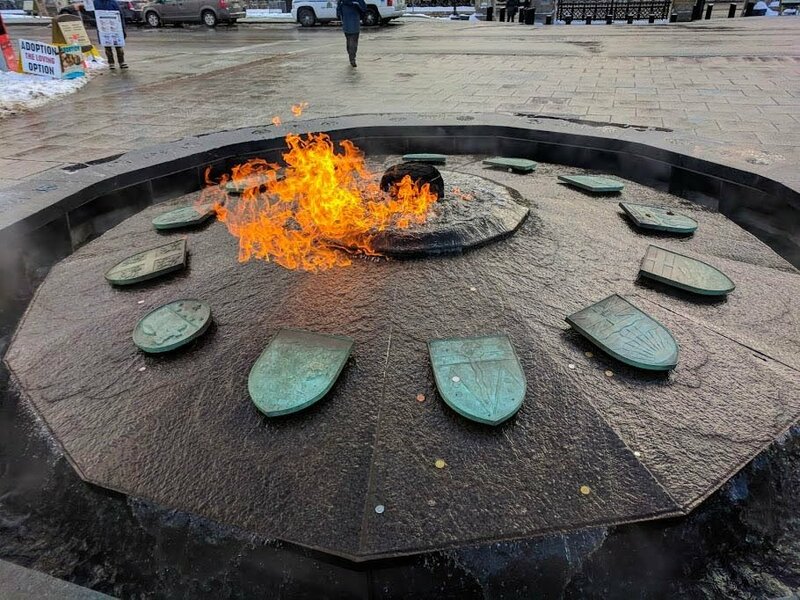 Lastly, you might notice the Centennial Flame directly in front of the main Parliament building, just inside the Queen’s Gate. The water in the Centennial Flame Fountain doesn’t freeze because it’s constantly moving. It was first lit in December 1966 to celebrate Canada’s Centenary of Confederation and has burned ever since (apart from when it is turned off for maintenance). Now for something completely different. House of Targ is a bus ride away from Ottawa’s downtown and is a live music venue with a bit of a twist. Or maybe it’s just got everything I’d want in a night out – live music, food (Pierogi to be exact) and 40 pinball machines. If you haven’t eaten a Pierogi before you haven’t really lived. They’re a cross between a ravioli and a dumpling and at House of Targ they’re filled with a range of delicious ingredients like potato, cheese, spinach, mushroom, roasted garlic and artichoke hearts. The live music venues hosts bands year round, but if you want to show off your pinball skills you should definitely visit for the monthly pinball tournament. I wanted to go dog sledding while I was in Ottawa so very much. But I was on my own and had very limited downtime so I had to let it past the keeper. 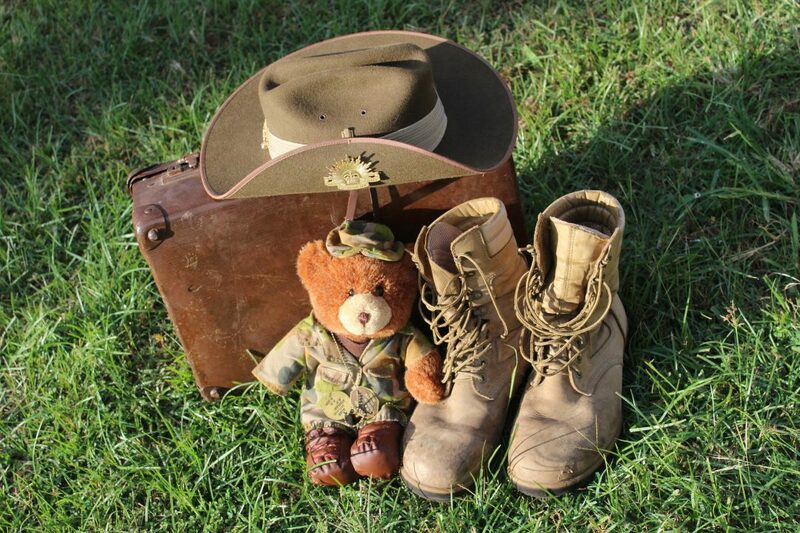 If you’ve got kids, visiting Escapade Eskimo is a fun way to spend the day. The farm is 75 minutes drive from Ottawa, so you’ll have to rent a car to get there but you can spend a whole or half day doing a few different activities. Escapade Eskimo’s kennel has 35 dogs and is run by Sylvain Drapeau and his family. It offers dog sledding trips ranging from 2km to two days in length, snowshoeing and “sliding”, and has accommodation if you want to stay the night. Where to Stay: The Hi Ottawa Jail Hostel is a former jail converted into a hostel and is an awesome, historic place to stay. Residents can take advantage of the 11am jail tour to learn about the building’s history and what life was like for the inmates. Read more about it here. Transportation: Walking is the quickest and easiest way to get around Ottawa, however there’s also a great bus system that I used to get from the Airport to downtown. Bus 92 took me almost to my hostel door in about 25 minutes. 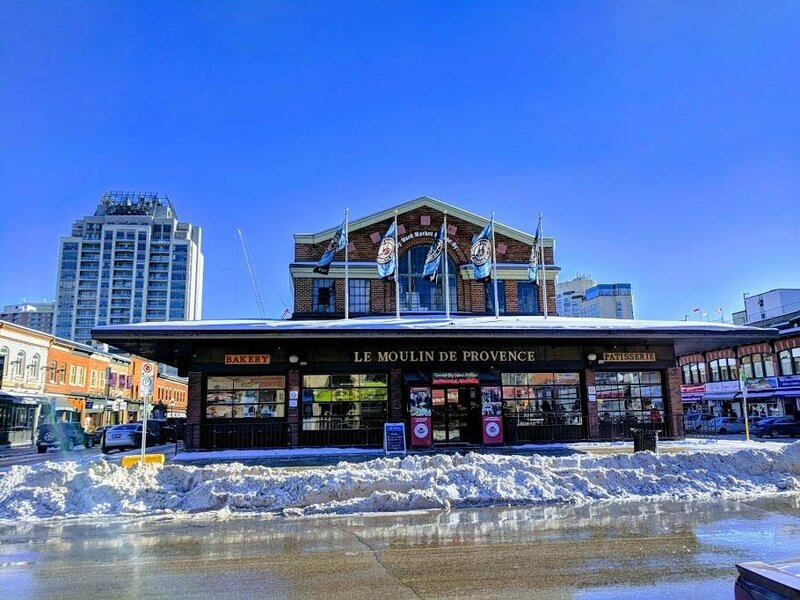 You can also take the train to other provinces within Canada, if you’re looking for some relatively inexpensive travel options. Where to Eat: In case you missed it, these are my favourite Ottawa restaurants and cafes. Local Airport: The Ottawa International Airport code is YOW and while there are no direct flights from San Francisco, I flew to Montreal then hopped over to Ottawa on an hour’s flight. A giant spider?! Seriously! How many people had nightmares after visiting Ottawa? ahaha! All the rest looked awesome, though. It’s sticky hot right now in Brisbane and I’m dreaming of a cold snowy weather. Also, I didn’t know dragon boat racing on ice was a thing. It looks super hard! Ice dragon boat racing? That sounds like so much fun! There’s also a Maman sculpture in Bentonville, Arkansas. It’s at the Crystal Bridges Art Museum and it’s, shall we say, impressive. Ice skating on the canal would be amazing! That would definitely be one heck of a workout if you skated the whole thing! Great post, Id love to visit one day! Lovely post! I would love to visit Ottawa! I’m not sure I could handle the cold for too long though! Haha! I would probably spend a lot of time in the mall shopping and staying warm! I lived in Toronto nearly 30 years ago for a while and wish I had seen more of the country- I have since visited Vancouver which we loved and ottowa and Montreal are high on my list next time we are in Canada ?? So much beautiful architecture in Ottowa! It looks beautiful and I didn’t really know much about it before reading this. Thanks for sharing these great ideas! 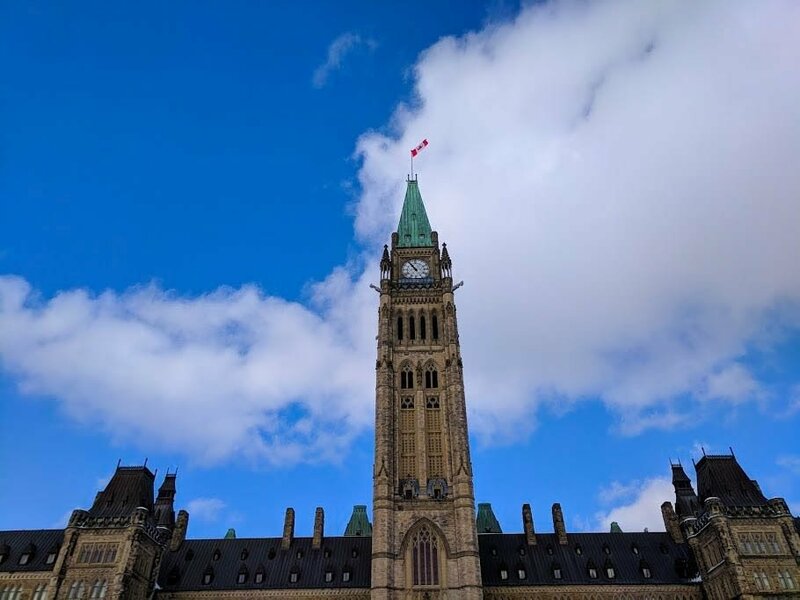 Thanks for sharing this glimpse into Ottawa – adding it to my itinerary ideas for our family sabbatical in 2020! Glad to read you enjoyed your stay in Ottawa. Hope you’ll be able to return in another season to see how lovely Ottawa really is year round. It’s (literally, I guess!) so cool that the river freezes and you can skate through a city! What an amazing city. Isn’t the world wonderful! Oh Canada! It’s been ages since I last visited and I would dearly love to return. Been reading Louise Penny’s mystery novels which are set in Canada and now I’ve read your post. It’s a sign. Wow! 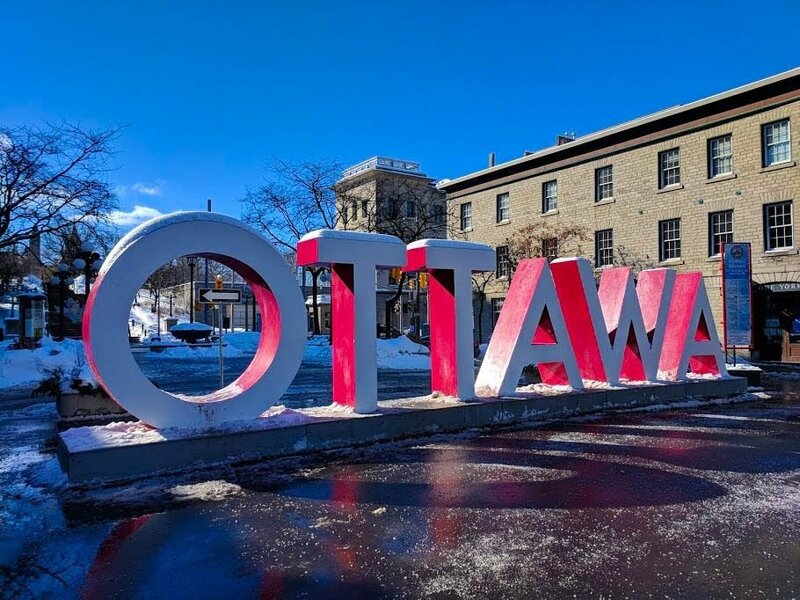 I’ve never thought of visiting Ottawa before, but you make it sound so fun, even in the freezing cold of winter! I would love to ice skate on the river! Wow! Wow! Wow! What a GORGEOUS place you were blessed to visit! Gorgeous photos and I’m always amazed at the ice sculptures. I also love the Cathedral which is so imposing. We visited Toronto and Quebec but unfortunately didn’t get to Ottawa – perhaps on the next visit. It’s so beautiful! The bright blue skies against the white snow is SO dreamy. So much of Canada is on my list, I can’t wait to get there. I’ll pass on the giant spider, but everything else looks like fun. That Ice Dragon Boat Festival would be so cool to watch. It looks like way too much work to participate in though! For some reason this article just makes me realize how weird us Canadians are, especially in winter. We skate down our frozen rivers (in some cases people skate down them to get to work instead of drive), we find a way to continue ‘boating’ on these frozen rivers and we take giant chunks of ice and carve things. Bunch of weirdos. But I love it, being a Canadian is the best! Wow this city is so beautiful, and full of fun! It’s a shame , I am Canadian and have never been to the eastern parts of Canada. I was raised in Vancouver. 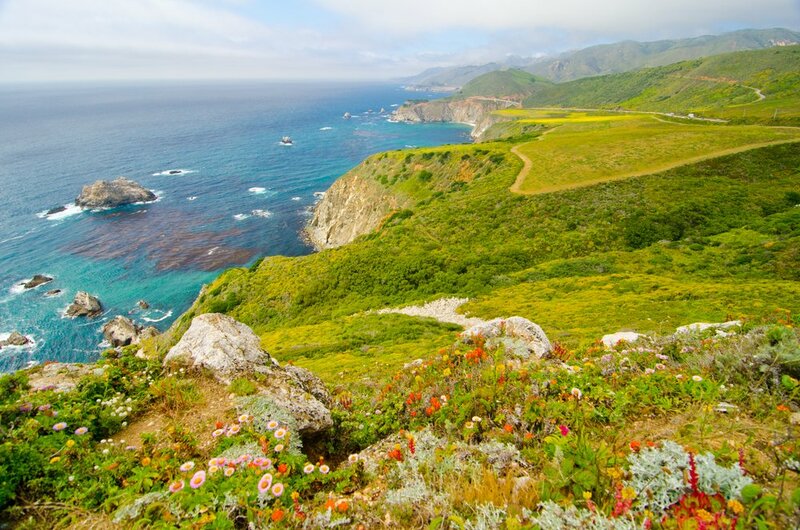 I see you are in SFo as an expat- a very fav city of mine! I went to college close by..
haha love how Ottawa embraces the cold with all those awesome winter activities – its certainly sounds like a really cool and unique place to visit! Coming from Finland, I’m used to the winter activities. Then again, I live in Thailand at the moment so I kind of ran off so I could avoid the cold weather. Your post made me miss winter a little bit, though. It is so beautiful over there! Ottawa seems definitely a place not to miss. Wow you got to see and do so much during your time in Ottawa! What can we say us Canadians embrace winter!! Ottawa is such a beautiful city. Did you explore the Glebe? It’s my favourite neighbourhood in Ottawa – great restaurants! Love this list! I visited Ottawa for the first time last summer and ticked off a few of these must-do’s! Parliament was my favourite, it reminded me of a Harry Potter movie. Wow all of that snow is stunning! We are heading to Alaska tomorrow and to be honest I am a total baby in the cold so thank you for showing me the beautiful side of being freezing! HA! Wow, the ice sculptures are amazing. Winterlude looks like my kind of festival, although the cold is not appealing 🙂 I’d love to try dog sledding. Is it fun? Ottawa seems like a beautiful city to spend the Winter in! 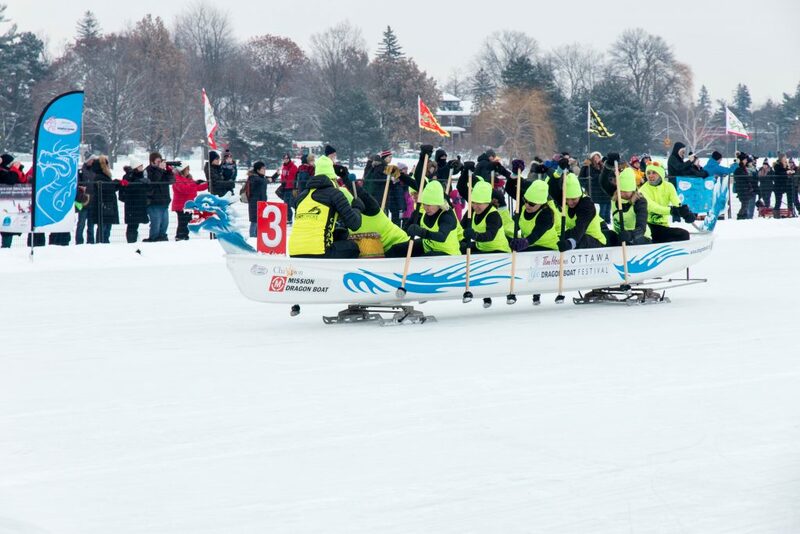 The Dragon Ice Boat races sound fun to do! So many great suggestions to enjoy winter outside of your typical skiing, sledding, and skating. Ottawa looks like a winter paradise! Such stunning snow shots and there seems to be plenty to do! That Maman sculpture reminds me of the things from Stranger Things! We hope to explore Ottawa at some point in the next year or so; these tips are great! Thanks! YES! I thought of Stranger Things as well when I saw this sculpture in real life! Hahaha, it’s impossible not to I think. I seriously love this post! It looks like such a great place to visit in winter. Pinned! It’s so hot down under right now, winter in Ottowa is looking really appealing! There’s so much cool stuff to do (excuse the pun,) although I think I’d have to work backwards and start with the dog sledding! Side note: There’s a whole exhibition of Louis’ Spiders at SFMOMA. It’s super cool! 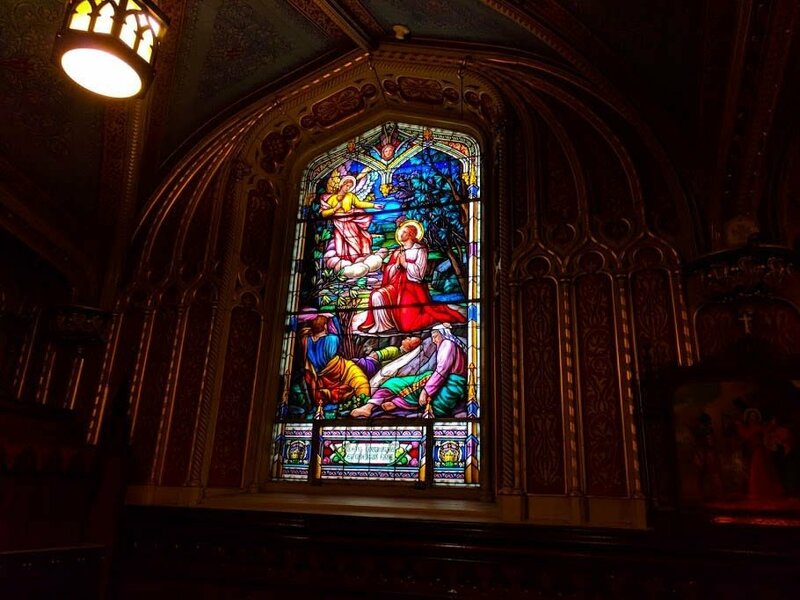 Your photo of the glass in the cathedral is absolutely stunning!!!!! Beautiful color. The dragon boat races look hilarious!! I wouldn’t mind watching that for a bit, but it does sound really, really cold, lol.